Very dangerous precedent indeed. Remember the Challenger disaster? The scientists were ‘overly cautious’ so they went ahead with the mission despite warnings, and…boom. Remember Katrina? Engineers warned for years that the levies were insufficient and sitting ducks for a decently powerful storm…oops. 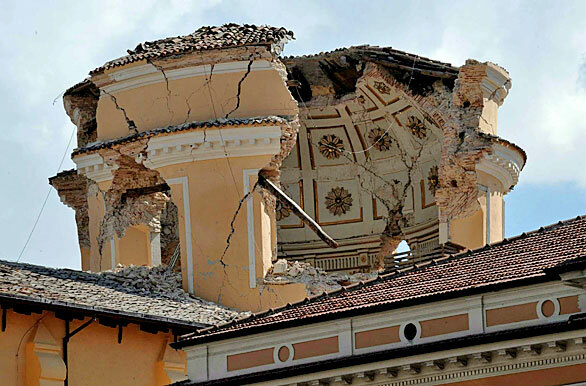 So negligence in those situations was excusable, but not adequately shouting from the mountaintops about an impending earthquake – an earthquake which was just as likely to hit in a century as this past year – is punishable by prison sentences. My nephew now reports in the last couple of days from where he is (Korea I think) swinging around inside the 18th floor of a high rise and getting squeamish. One of his Facebook friends reports the 27th floor where he /she lives was pretty heady. I posted Tom Waits ‘The piano has been drinking’ after making comment I supposed it didn’t cut it to suggest the building had been drinking, which did arouse a laugh. After all, that’s my beloved sister’s son and his wife and child I felt alerted by regards earthquakes to send an image that might help him get through another rumble like that (it was big). I do appreciate Big M’s heartfelt report of what he thinks about the seismologists’ being jailed. The seven were found guilty of multiple manslaughter, after having been accused of giving “falsely reassuring messages” to the population prior to the quake in April. Witnesses in the trial claimed that their relatives chose not to leave their houses before the quake struck because they were reassured by the committee that a bigger quake was unlikely, although not impossible. The point is that, most of the time people do the right thing, with the best intention, and the best interest of their clients/patients/customers/recipients at heart. No one maliciously hopes for mayhem and disaster, unless they have a psychiatric condition. Even then, they are hardly culpable for the misfortunes described in Emmjay’s most excellent essay! You see, M, an event like this earthquake, natural and unavoidable as it was, creates a helluva lot of emotional turmoil; and chief among the ‘drivers’ of all that emotion is frustration, which leads inevitably to anger; and anger is a dangerous emotion to have too much of it just floating round directionlessly, especially during what inevitably becomes a national disaster; so the people must be given something to focus their anger on before they start doing things like blaming the authorities for not imposing earthquake-proof building codes and for not providing adequate emergency services in the face of known natural threats. So they need to find a scapegoat… and it doesn’t really matter who is used for this purpose; anyone who is vulnerable and who can somehow be tied in to the causation of the disaser is likely to find themselves in this unenviable position. Solveable? Well, it’s true one can’t prevent earthquakes; even if it is now possible to cause them (a fact which may be of significance when paired with the apparent absence of ‘natural’ seizmological warning in the case of this earthquake… does this not in itself suggest the possibility of a non-natural cause for it? HAARP?) BUT it IS possible to be adequately prepared for them in order to at least minimize damage and casualty-levels. Those who were involved with the Wivenhoe Dam flood management are actually forbidden by court order from commenting on how the waters were released. It’s about protecting the government from litigation. Given that they were dealing with unprecedented inflows with nearly a metre of rain falling in parts of the catchment in a relatively short time. What actually happened was a double peak. Had the dam not been there there would have been a flood peak about 5 metres above the 1974 flood. The dam did what it was designed to do. Large parts of Ipswich and most of the Gold Coast, particularly the canal developments which were allowed to be developed by Joh have housing below the 1:100 year flood, so the comments by some goose councillor is to deflect responsibility from the council. The Brisbane flood was an event greater than 1:100 and more like 1:500 year, just like the floods in the Lachlan and Murrumbidgee valleys were probably the biggest floods since white settlement. Who’d make a decision or an opinion nowadays when some prick pollie or donkey brained journo or councillor is looking sue you or insurance company runs away from its responsibilities. What HAS the bass singer got down his trousers ? I can see, I think why he’s singing bass. Otherwise, the song seems to be a real estate complaint. Of course, in later movies where they actually do show them, he has real high-tech legs… nothin’ but the best for da King! But he’s still a little unsteady on ’em. Isn’t it why they got mad in Italy and jailed these scientists? Real estate depreciation? On the other hand, however, I personally found it well worth watching every second… whaddaya think caused the Japanese tsunami? Unless, of course, it’s a ‘blues-harp’! Another scapegoat ritual? Why am I not surprised? If designs are at fault then the engineers or architects are culpable but with natural disasters, even the best of designs can give up, so… I feel that it is a matter of severity of the natural disaster and the strength of the design that would have to be considered. I think it a bit over the top with punishing the designers or scientists when it comes to earth quakes or tsunamis. Holland is below sea level for a large part. One could claim it was always silly to live below sea level. Should we now put a possible future claim of ‘fault’ at the poor monks that were the original dijk builders some hundreds of years ago?